A new report from a employment firm Encore Careers and Northeastern University argues that while the U.S. may feel like it has a shortage of jobs right now, it could soon find itself in the opposite situation. They believe that over the coming decade, the U.S will have a shortage of workers, even by only assuming rather weak job growth of 1% per year versus the 1.9% per year job growth rate experienced from 1988 – 1998, and in-line with the 0.9% job growth experienced from 1998 – 2008. So jobs cold grow by 15.3 million through 2018 even based on weak growth. Meanwhile, the U.S. adult population will grow by a higher 21.8 million people, as shown below. 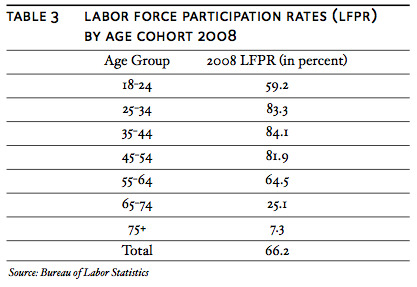 But it’s all about labour force participation. Due to ageing baby boomer’s, if current retirement trends continue then a huge wave of adult Americans will drop out of the work force due to retirement. This means that while the adult population will grow faster than job growth over the next 10 years, the labour force will only grow by 9.1 million people, which is far less than the amount of jobs the U.S. economy could need as it progresses. The likely economic response is that many older Americans will delay retirement, perhaps due to companies realising that they need to incentivise older skilled Americans to stay. Combined with an overall tighter labour market, this could lead to better wage growth than we’ve seen over the last 10 years. It appears demographics will be a wind behind young employees’ backs going forward. Hopefully other factors don’t overwhelm it. See the full report at Encore.